A break in has occurred at the Vault on Egis. 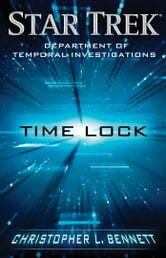 A time lock - slowing time in the Vault relative to actual time - is immediately put in place trapping director Andos and agent Tucsly inside with the intruders. One of the intruders appears to know more about what is in the Vaault than her coconspiritors. With the help of agents Garcia and Ranjea ad the new Denobulan DTI director Dulmur, solving the who part of their questions leads only to a bigger one - why?